* No Admin rights? You can use our Non-Admin installer, but you will also need to have the Microsoft Visual C++ 2013 Redistributable (x64 or x86) – 12.0.30501. Check your list of installed programs in Control Panel (under ‘Uninstall or change a program’). If the program is not listed, it will need to be installed by a user with Admin rights. Our default installer above already includes the x64 & x86 Redistributables. Unzip the downloaded file and double-click to install. You must also get a license key (see below). Supply details below to start your trial. A key will automatically be created and sent to your email with further instructions. Please check your spam folder if you don’t receive the email. Purchase one or more keys from our store. New license key(s) will be forwarded automatically. There is no need to re-install when upgrading from a trial to a full license – just enter the new license key. This is the free version of the add-in which lets you get data for A106 Gr. B and Group 1.1 flanges. It also includes the Wall thickness and Lorenz factor calculations. Simply download this installer and run – it doesn’t require Admin rights on your machine to install. (Of course there is no spyware or adware included). 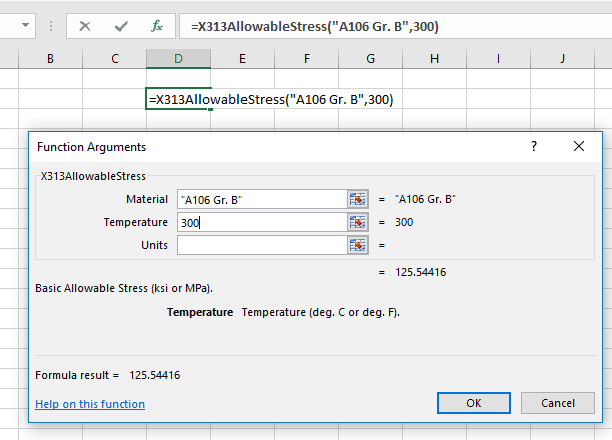 Now select a function, either by double-clicking or by using the cursor followed by the Tab key. 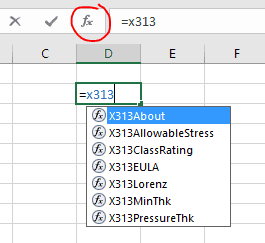 Then use the ‘fx‘ button (shown circled in red above) to display the Excel function helper – there you can go ahead and complete the formula inputs with help text to guide you. If you are using the full or trial version (rather than X313 Lite), you will need to Activate X313 before you can use all the functions.